Vast and benevolent - The land of Rajputs, folklores, sand and colors – Rajasthan is a heart-warming romantic medley. The air here has hint of sand but a true traveler ends up breathing colors. 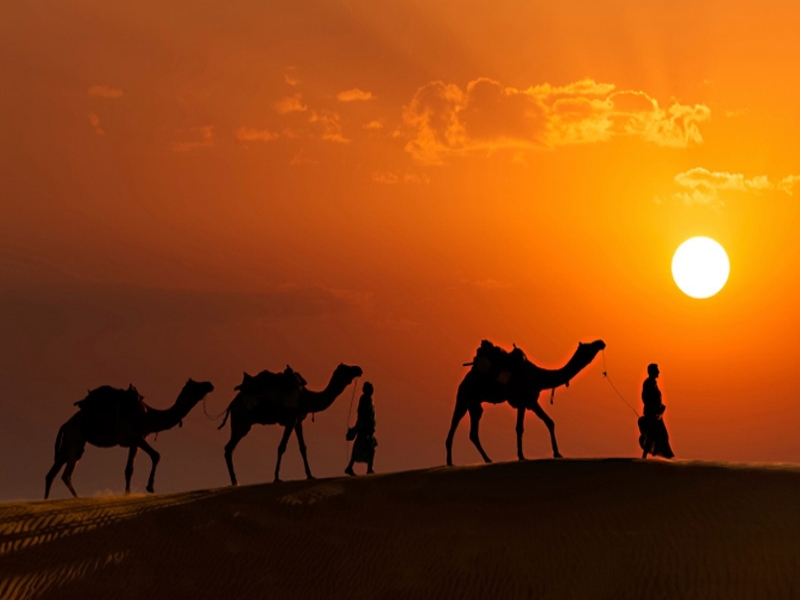 World renowned for its rich culture and heritage, Rajasthan will leave you subtly intoxicated as you ramble across. The trail of footsteps on sand might lead to a colorful village, delightful locals clad in vibrant robes or a smiling group of textured turbans. The sun in Rajasthan sets leaving behind even brighter hues for the curious eyes. Cultural performances, puppet shows and folk dances are highly entertaining. One may never feel like keeping down the kaleidoscope. The cities of Jaipur, Udaipur and Jodhpur buzz with stylish bars and clubs. For the party lovers, pubs come across as better option with good music and dance floor. Finding regular beer and bite at most of the bars will be quite easy; however luxury hotel bars will surely offer better experience. Sip a cocktail as you reel through colorful images of the day or dance away the night to this incredibly romantic place. This land of glory and fables is about colorful cities like Jaipur the pink city or Jodhpur the blue city. 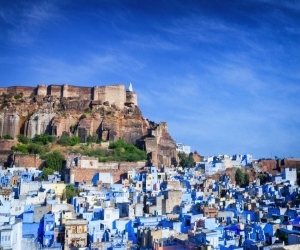 In Jodhpur the houses of Brahmins were colored blue in order to differentiate them from lower castes, and this tradition continues to play its role in city’s color scheme. The big, bold turbans on proud heads depict wearer’s clan, caste and often village. In totality, Rajasthan reflects the true spirit of India, the cultural mosaic that lures travelers from faraway lands. The very popular Pushkar Fair is an ideal occasion to taste its culture curry - An occasion to collect some of the brightest marbles for a playful traveler’s soul. Proud and living by their heritage and customs, the rural population of Rajasthan has started thinking over its own backward-looking image. Although constant droughts and rough terrain are ground realities, this land of colorful dreams now aspires towards a better future. Jaipur the capital city is bracing up to be in line with other Indian metropolitans and has shown considerable growth in literacy rate recently. Compiling a must-see list for a trip to Rajasthan can leave anyone perplexed. A land populous with architectural delights, royal hamlets, exotic villages, colorful cities, pulsating local markets, wildlife reserves and pilgrimages, Rajasthan is more like miniature India. Jaipur: This beautiful ‘Pink City’ is all about heritage sites and architectural marvels. The popular ones are Amber Fort, Jal Mahal and Hawa Mahal. Jodhpur: Known as ‘Sun City’ Jodhpur’s brightest jewels are the Mehrangarh Fort, Umaid Bhawan and Khejarla Fort. Jaisalmer: Rajasthan’s charming desert town, Jaisalmer is known for Jaisalmer Fort and the desert landscape. 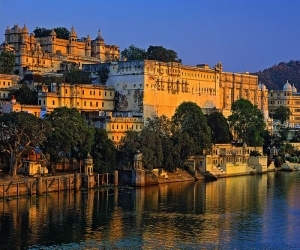 Udaipur: Udaipur is better known as city of lakes. The most famous is the Pichola Lake. There are heritage hotels, parks, museums, bars & pubs and remarkable cuisine. Mount Abu: Mount Abu is the only hill station in one of the world's oldest mountain ranges - the Aravalli Range. It is popular for Dilwara Jain temple, a well-known pilgrimage site. Mount Abu is a place to unwind - A place to enjoy small delights like sunset views and temple prayers. Stay options in Rajasthan are many but to get a real taste of regal lifestyle like that of prince and princess of old days, one need to stay at heritage properties in Rajasthan. Do experience the fun of camel safari or explore Rajasthan on horseback. Also, taste the delight of hot air ballooning in Jaipur and get an aerial view of some of the well-known monuments. 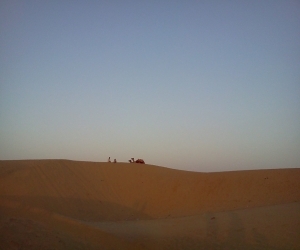 One can simply not miss on a desert safari that lets you explore the vast Thar Desert and its amazing rural life. The best time to visit Rajasthan is in the months of September to April. One can also consider months of July and August, as it is a dry land and it does not rain much. Desert areas like Jaisalmer and Bikaner should be visited in winters only, whereas Jaipur, Pushkar, Udaipur, Jodhpur and other cities can be visited throughout the year. The traces of epic history of Rajasthan lead to more than 5000 years old Indus Valley Civilization. Rajasthan was a major part of the Indus Valley region. Next milestone leads to time period around 405-35 BC, when two strong dynasties ruled the land – Saka (ruled western part of India) and Kushans (ruled northern part of the subcontinent). Eventually, Saka got hold of the land and established Saka era with Saka calendar. Some of the prominent dynasties that find mention in Rajasthan’s history are the Rajputs, Jats, Yadavs, Gurjars, Bhils, Meenas and Charans. All these tribes have their own share of venerable roles in carving the essence of Rajasthan. Gurjars however stood out as a powerful dynasty and ruled the land for many generations. 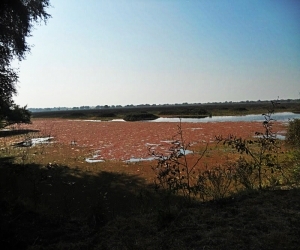 Apparently, the land was popularly known as Gurjaratra for a long time. Rajputs dominate the modern history of Rajasthan. With their rule over 18 princely states, Rajputs fought hard against Mughal invasions. They quite succeeded in their efforts, contributing to Mughals’ slower than anticipated access to the country. During Mughal rule, two outstanding battles were fought by Hindu rulers against them - Second Battle of Panipat (1556) and Battle of Haldighati (1576). Former was fought between legendry Samrat Hem Chandra Vikramaditya (also known as Hemu) and Mughal emperor Akbar. Battle of Haldighati involved Maharana Pratap Singh, the mighty ruler of Mewar, and Akbar. With time, Mughals started to weaken and the rule went back to Rajputs (in 18th century). British invaded India around 19th century and Rajput rulers ended up entering treaties with them, accepting their rule in return for local autonomy. Description of Rajasthan’s history would be incomplete without a mention of Marwaris, who played vital role in revamping the land and strengthening its economy. Unique and deep-rooted, Rajasthan’s vibrant culture is flavored with enchanting architecture, hypnotic palaces, spell-binding traditions, heroic royalties, exotic food, ethnic jewelry, mesmerizing clothing and the most important, its warm-hearted, ever-welcoming people. The folk culture is a blissful blend of music, dance, art and craft. Classical and folk music come across as simple depiction that is highly rhythmical. Several songs have been passed on through generations that narrate engaging tales of heroic deeds, love, wars, religious devotion or guileless acts of daily life. These are usually accompanied by musical instruments like sitar, dholak, sarangi, and euphoric dancing. The Ghoomar dance (Udaipur) and Kalbeliya dance (Jaisalmer) have found recognition on international platform. Rajasthani arts and handicrafts span across Ghesso items, finely carved lac and ivory jewelry, sandalwood idols, jharokas with complex designs, zari embroidery, tie and dye prints, which have huge worldwide demand. Celebrated with gaiety and lots of enthusiasm, Diwali, Holi, Teej, Gangaur, Gogaji, Janmashtami, Shri Devnarayan Jayanti and Makar Sankranti are some of the popular festivals of the region. The highly renowned Pushkar fair is a yearly affair that ends up being a center of ceaseless excitement. Coming to Rajasthani cuisine, Rajasthani cooking is a fruition of agricultural conditions of the land and war-like existences. The flavors of Rajasthani food are more on the spicy side. Scarcity of water and availability of ingredients in this arid region led to preference for food items that could last for many days. Some common snacks are Bikaneri Bhujia, Pyaaj Kachori and Mirchi Bada. Daal-baati-churma is the most famous Rajasthani dish, wherein Daal is lentil curry, baati is round balls of wheat flour baked in charcoal fire, and churma is a sweet treat of crushed wheat balls rolled in sugar or jaggery topped with ghee. Dairy based sweet products like Alwar ka mawa, Mawa Kachori, Malpuas and Rasgullas are very popular in Rajasthan. Most of the restaurants here serve vegetarian items. Both leavened as well as unleavened breads are easily available. For the non-vegetarians, finding a good restaurant will be more of a challenge, however avoid non-vegetarian food available at road side eateries. Shopping in Rajasthan is a truly delightful experience. Do not be surprised at your own child-like excitement as you browse through vibrant shops. Even if you are not in the mood to shell out money, do experience the fascinating energy that sweeps the market streets. Some of the best take-away include ethnic jewelry, marble sculptures, blue pottery, leather accessories and hand-woven carpets. Rajasthani handicrafts and handlooms are as rich in color as the local weavers in their spirit. As intricate patterns and unmatched craftsmanship allure your senses, chances are that you end up buying every other piece that catches your eye. There are a plethora of options to shop from - Government Emporium to private shops to local bazaars. Also, there are artisan villages like Sanganer and Bagru, where you can watch artisans creating beautiful items and can purchase directly from them. Bargain is the watchword when shopping in Rajasthan. Do not be ready to shell out money at the first quote of the retailer. Local vendors and some of the tourist shops are open to bargaining, whereas big/renowned stores like India Craft, National Handloom and government organizations sell at fixed rates.